The Denver Formation contained fossils and bones from dinosaurs like Tyrannosaurus rex and Triceratops. While the forests of vegetation, dinosaurs, and other organisms thrived, their reign would come to an end at the Cretaceous–Paleogene boundary (which is also known as the K-T boundary). In an instant, millions of species are obliterated from a meteor impact in Mexico’s Yucatan Peninsula. While this extinction lead to the dinosaurs’ and other organisms’ demise, some life did prevail to repopulate the earth as it recovered from this tremendous disaster. The uplifted Front Range continued to constantly erode and, by 40 million years ago, the range was once again buried in its own rubble. 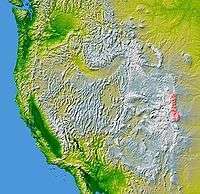 ↑ http://geonames.usgs.gov/pls/gnispublic | U.S. Geological Survey confirms that the Laramie Mountains(range) are the northern extent of the Front Range. 1 2 3 4 5 6 7 8 9 10 11 12 13 Johnson, Kirk R.; et al. (2006). Ancient Denvers. Fulcrum Publishing. ISBN 978-1-55591-554-4. 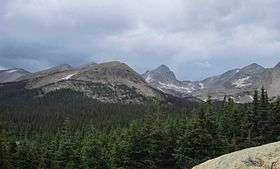 ↑ The summit of Grays Peak is the highest point on the Continental Divide of North America.